You can instruct Veeam Backup & Replication to exclude pagefile.sys and hiberfil.sys files from backups or replicas of Microsoft Windows VMs. hiberfil.sys is a system file created by the OS for correct work of the hibernate mode. pagefile.sys is a swap file. Swap files are dynamic in nature and can change intensively between job sessions, even if a VM itself does not change much. To exclude these files, you must enable the Exclude swap file blocks option in the job settings. 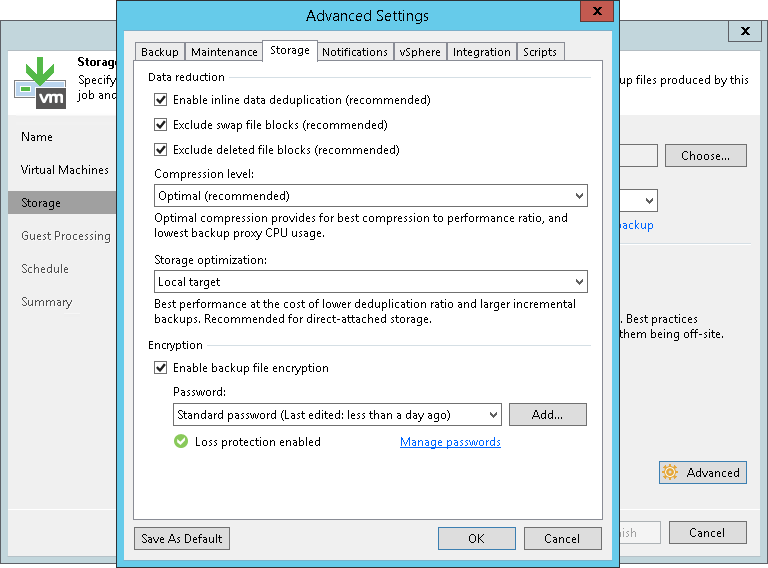 Veeam Backup & Replication will identify data blocks of these files and exclude them from processing. As a result, the size of incremental backups and replicas will be smaller. Veeam Backup & Replication accesses the MFT file on the VM guest OS to identify data blocks of pagefile.sys and hiberfil.sys files and zeros them out. If a data block of the VM image contains only blocks of these files, Veeam Backup & Replication does not copy this data block to the target. If a data block of the VM image contains blocks of these files and other data, Veeam Backup & Replication copies this block to the target. Veeam Backup & Replication can exclude blocks of pagefile.sys and hiberfil.sys files only on the VM guest OS with Microsoft Windows NTFS.